Joe DiPietro and Jimmy Roberts were signed by Williamson Music in 1997. Their first venture, I LOVE YOU, YOU'RE PERFECT, NOW CHANGE, opened Off-Broadway three years ago and is still going strong. 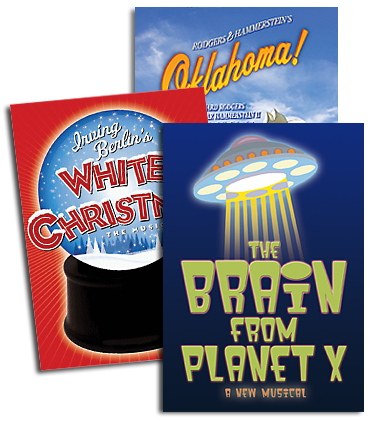 Currently playing in a number of cities around the world, it will be licensed through The R&H Theatre Library. Their second musical, MEN, will be presented in Sacramento this summer. Prior to I LOVE YOU..., Jimmy had an eclectic career as a composer (THE VELVETEEN RABBIT, A...MY NAME IS STILL ALICE), musical director and pianist at New York's Drake Hotel. A graduate of the Manhattan School of Music, he was an ASCAP Award winner and a resident music director at NYU's Tisch School for the Arts. Joe's writing career began almost accidentally on his way to law school, with a series of sketches about dating in contemporary Manhattan; LOVE LEMMINGS developed a cult following in its various Off-Off-Broadway incarnations, and metamorphosed into I LOVE YOU... Joe is also the author of the Off-Broadway comedy OVER THE RIVER AND THROUGH THE WOODS, and several other plays in development. Earlier this spring a reading was held of his new book for the Gershwin musical OH, KAY!, commissioned by The Ira and Leonore Gershwin Trust. Recently, Joe and Jimmy came to our offices to talk about music, lyrics and how they put them together. We began by remembering the man who brought them to R&H - Jamie Hammerstein. JOE: I would not be sitting here today if it wasn't for Jamie Hammerstein. He was the most artistic producer I've ever met; he came to the job as a director and he knew about writing. He knew the process, he knew how to let things develop naturally...I met him at such an early time in my career that he really helped shape how and why I became a writer. What I learned from him, I hope, will stay with me forever. JIMMY: Jamie was a producer in the best possible sense of the word...He imparted wisdom, but did not impose it. He was smart and supportive, but he never gave us ultimatums. He would never tell you how to solve the problem, but he was always right about where it was. HAPPY TALK: How did you two meet? JOE: I had been developing my show, LOVE LEMMINGS, which was a series of sketches about dating. A mutual friend introduced us because she thought that the sketches could be improved with some music. JIMMY:And I, ironically, didn't agree. I saw a tape of the show, liked Joe's sketches very much, in fact, so much that I thought, ""Why ruin them with music?"" JOE: But about a year later, I recognized that the show had run its course, and that maybe music could take it further. I sought out Jimmy, and we began writing. Believe me, the lyrics weren't exactly stellar at that point, but I could see what music did to an audience, how the music just opened it up, and I said to Jimmy, ""Let's really do this!"" HT: Jimmy, you have a strong musical background - Manhattan School of Music, Tisch School for the Arts, etc. JIMMY: Yes, though during school my tastes were... confusing. I was interested in classical, in musical theatre, in pop. Once at a seminar, I mentioned to the speaker that I wasn't sure which direction I wanted to follow, and he said, ""I can see that."" I looked down and realized I had the score for THE RITE OF SPRING in one hand and THE SOUND OF MUSIC in the other. JOE: But I had no background in musical theatre... In fact, the first time a producer suggested turning my sketches into a revue, I sort of shrugged and thought, ""Well that sounds easy!"" In other words, sometimes it's good to be young and stupid because you don't realize how difficult it is. JIMMY: But you learned quickly. JOE: I learned because you taught me! The whole time we were cultivating I LOVE YOU... Jimmy kept after me...I was a total novice at lyric writing, and he really had the patience to sit me down and teach me. He pointed me in the direction of the great lyricists I should read - Oscar Hammerstein, Lorenz Hart, Cole Porter...We were a great combination - Jimmy had all that training and education, and I was a clean slate. HT: Did reading those great lyricists inspire or intimidate you? JOE: Both, actually. But as a writer I think you should read the people who intimidate you, and try to figure out why. JIMMY: It's also important to mention that as I LOVE YOU... began to take shape, a crucial component was our director, Joel Bishoff, who had his own long-time association with Jamie Hammerstein and believed thoroughly in our work. Joel really helped focus our ideas, he streamlined the production as a whole. HT: So, late in the summer of 1996, I LOVE YOU... opens at the Westside Theatre. It's your Off-Broadway debut - and the dog days of summer. What were your expectations? JOE: Oh, I remember thinking, ""Will this last to December? Six months would be respectable, six months would be OK, it might make our second show easier to get off the ground."" But to see it take off the way it has...! JIMMY:I didn't dare think about how it might do. I had been enough of a musical director to know that the odds were really against us. I remember thinking, ""It will be enough just to do the work."" But...we also knew we had something. JIMMY:From those earliest readings, those first few times we tried out a couple of songs with Joe's sketches, people reacted, and they reacted the right way. We heard the laughter, there was an immediate connection with the audience, the same connection we see today. Something was happening. JOE: At one of the first performances we did, a woman in the middle of the first act screamed out, ""That's my life!"" She was having so much fun, and she saw herself onstage. That kind of thing has happened with the show wherever it plays. Jamie Hammerstein told me once, ""My mother would have loved this show."" And that was why he did it, that was why he decided to stick with us all the way through. HT:And you've stuck with each other. JOE: Oh, sure. We've both worked on other projects over the past few years, but I don't think there was ever a moment during I LOVE YOU... when we didn't think we'd move on to the next one together. JIMMY:I'm very proud of where our collaboration has progressed to at this point...I recently read a book by Tom Jones [lyricist of THE FANTASTICKS], and in a chapter on collaborating he said, and I'm paraphrasing, ""Your partner can be different from you in every way, but if you both like the same type of theater"" - and I find that Joe and I do, we get enthused about the same things - ""then that's important."" JOE: It's a very fluid process with us by now...We've had our baptism-by-fire, we've been in the trenches with a real, honest-to-God, out-of-town tryout [I LOVE YOU... at New Haven's Long Wharf]...This time, I won't say it's easier, but we're coming to it from a more solid place. The writing of our new show is happening much quicker, because we know each other better. HT:Tell us about the new show. JIMMY:It's called MEN, and it's based on a 1986 West German film. It's going to get its first production this summer, at the B Street Theater in Sacramento, and we're ready to see it up on its feet. The work gets really fun at this point, to see what will happen when the actors and the audience get ahold of it. JOE: It's the mystery part we like...There is always something in a show you think is going to work great, and it doesn't, and then there's something that you think is only OK, and it works like gangbusters. As Jamie Hammerstein said, ""There's always a surprise in a musical.""